Your newborn is due to arrive in your life soon. You know that it’s a good idea to have something to engage your newborn with and since your newborn will be lying down most of the time, you need something safe that you can lay your newborn down on. Will a blanket on the floor do? Or what about one of those fancy baby play mats? Should You Get a Baby Play Mat? In the first few weeks, your newborn will mainly see in black and white-type contrasting, strong colors until his or her eyesight starts to develop further. When lying down, your newborn will only be able to see objects that are close (approximately 14 inches away) so unless you have interesting hanging objects that are close to your newborn, your baby will probably get bored and start fussing after a while. Almost all good baby play mats will have attractive hanging objects to encourage your baby to engage and reach for them. 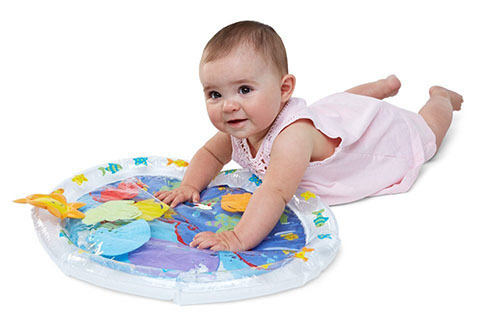 Some baby play mats have moving parts, sweet lullabies and a mirror. All these are designed to help your baby develop his or her eyesight (as he or she examines the hanging objects) and to reach for them. A baby play mat is also a necessary purchase because you will need to get your newborn started on tummy time. A well-designed baby play mat will have this in mind and will include interesting things on ground level too so that your baby can play with them while on tummy time. Here are our recommendations for the best 5 baby play mats. Don’t you worry about your newborn getting bored while playing on this play mat? 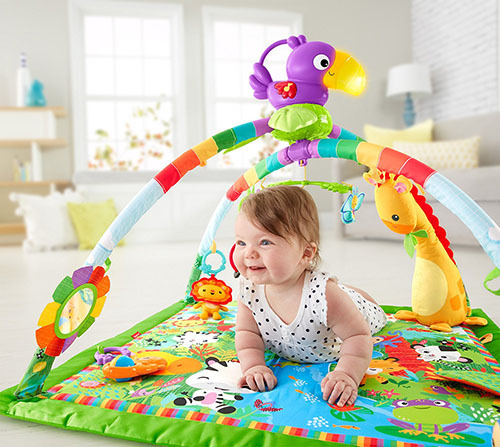 This Fisher-Price Music and Lights baby play mat has more than 10 toys/activities and a bonus removable toucan that plays music and flashing lights. The toys also include an adorable cuddly giraffe that you could remove from the play mat and use as a separate soft toy if you wish. This is great especially if your newborn is looking for an attachment toy. The play mat is full of engaging colors and cute pictures of animals. The play mat itself has a few different textures including a soft, satin border and crinkle leaf. There is also a mirror. We really like that this play mat is programmed to respond to your baby’s kicks and will play music accordingly when certain triggers are met. This will introduce your child to the concept of cause and effect. The music plays up to 20 minutes in long-play mode which will hopefully buy you 20 minutes of peace and time to yourself! Think shower and food maybe? This Bright Starts Sunny Safari Baby’s Play Place is a little bit different in design from the others. Get this one if you have older children or a pet and want to provide your baby with a little extra protection. This baby play mat has a border that can be lifted up to provide a “wall” around baby. It won’t stop a determined child or animal but it can help you to establish boundaries for older siblings and naughty pets. You simply tell them that they are not allowed to step beyond these boundaries when baby is on the play mat. If you are not needing to use the play mat “wall”, you can lower it down to provide your baby with a little extra space to play on. 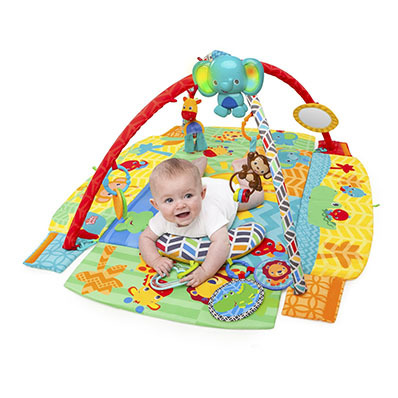 This baby play mat comes with 10 toys that can be attached to various spots around the mat and the play mat also plays lights and music that are baby-motion or parent activated. Just like the previous play mat, the music also plays for 20 minutes. A bonus of this play mat is that it comes with a small U-shaped pillow that is great for babies that are starting out on tummy time [LINK TO TUMMY TIME POST]. 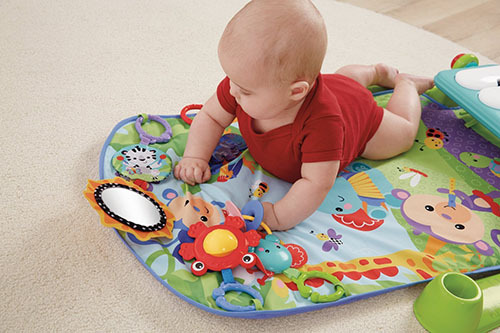 This play mat also has a mirror and a removable electronic toy that can be attached to a car seat bar too. The manufacturer also states that this toy meets global phthalate, lead requirements and is BPA-free. This Fisher-Price Piano Gym, Kick and Play stands out as a play mat because of its well-designed piano keys that come with the play mat. This play mat is especially perfect for parents who want their newborn to be musical. Place your newborn’s legs close to the keyboard and when he or she kicks next, cheerful music will play. Your newborn will soon work out that whenever he or she taps down, the music will play, which also is a good way to teach about cause and effect. The keyboard also helps your child to get started on leg coordination. 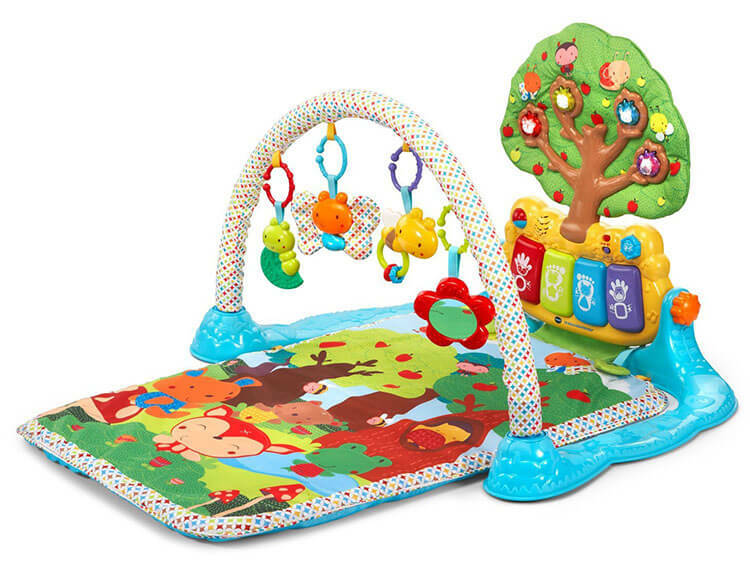 The play mat comes with bright, sunny colors and cute animal cartoons as well as a range of hanging toys that include crinkle material, plastic and toys that rattle. The long-play music only goes up to 15 minutes so it’s not as long as the previous play mats. This play mat is versatile in that the keyboard can be adjusted to face up so that it becomes an ordinary keyboard that your child can use once he or she can sit up. The VTech Baby Lil’ Critters Musical Glow Gym is also another great baby play mat for parents who want to get their child started on music early. It has 4 colorful piano-like keys but also comes with a flourishing tree that lights up and plays music. The keys also play drum sounds if preferred. The theme of the play mat is forest animals and we really like this. This play mat is probably more interactive than some of the rest as in electronic mode, the play mat also asks simple questions to engage your child. This baby play mat comes with 4 dangling toys with different textures, a mirror, teether, rattle and also 2 pull tags that play music and sounds. Just like the Fisher-Price Piano Gym, the keyboard can be adjusted to face up so that your child can keep playing with the keyboard once he or she can sit up. The manufacturer confirms that the toys on this baby play mat are BPA-free and conforms to US toy safety standards. We thought that the Earlyears Fill ‘N Fun Water Play Mat deserved a mention on our top 5 list because it is unique compared to other baby play mats and is especially great for tummy time. If you have a baby who loves playing with water, this will be the best play mat you can get him or her. This baby play mat is not made out of cloth like other play mats but is filled with water! This inflatable play mat has 6 moving creatures; seahorse, octopus, starfish, turtle and 2 fish. Encourage your baby to remain on tummy time while experiencing what it is like to bob up and down and try to catch the moving water creatures. This mat is probably not suitable for a newborn but it is serious fun for a 3-month-old+ baby. For a boisterous young baby who likes to be constantly moving, this is probably going to be a good distraction and great for tactile development and hand-eye coordination. The seller states that this baby play mat is BPA and phthalate-free. Nevertheless, the baby play mat is made from plastic so if you are concerned about your baby licking the play mat, maybe skip this one and get one of the other cloth ones above instead.